For more than 90 years, Rohm and Haas has been a leader in specialty chemical technology. Our chemistry is found today in paint and coatings, adhesives and sealants, household cleaning products, personal computers and electronic components, construction materials and thousands of everyday products. In every corner of the world, Rohm and Haas products are "Quietly Improving the Quality of Life.TM"
Rohm and Haas Company is one of the world's largest manufacturers of specialty chemicals – technologically sophisticated materials that find their way into applications in a variety of major markets. Most Rohm and Haas products are never seen by consumers; rather, they are used by other industries to produce better-performing, high quality end-products and finished goods. The history of Rohm and Haas has been a series of innovative technical contributions to science and industry, usually taking place behind the scenes. 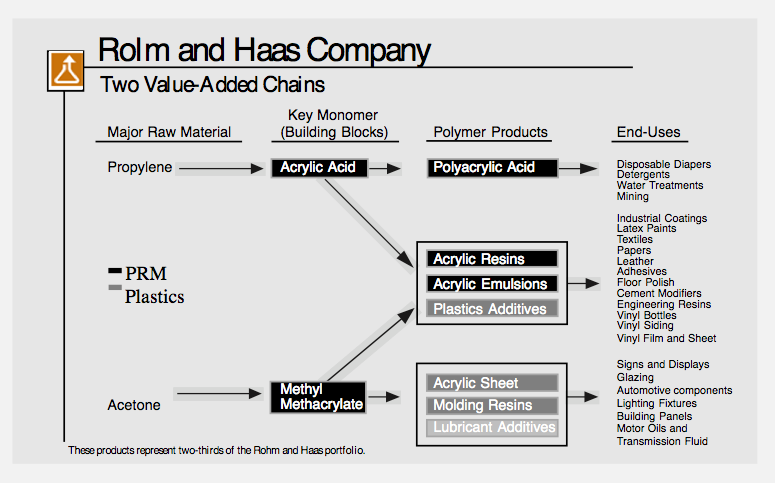 In 1999, Rohm and Haas acquired two great companies – LeaRonal, a maker of electronic chemicals, and Morton International, a global producer of specialty chemicals and salt. These acquisitions helped grow the company into today's Rohm and Haas, with sales of $6.5 billion and more than 20,000 employees. It operates approximately 150 research and manufacturing locations in 25 countries. Rohm and Haas is committed to sustainable development and has pledged to strive to ensure that operations and products meet the needs of the present global community without compromising the ability of future generations to meet their needs. Economic growth, environmental protection and social responsibility are integral considerations in the company's business decisions. The Rohm and Haas Deer Park, Texas, facility has operated for over 52 years and is located on the Houston Ship Channel approximately 22 miles east of downtown Houston. The site is over 900 acres and employs more than 800 people. It serves as Rohm and Haas Company's flagship plant and is the largest monomer manufacturer for key Rohm and Haas products. The plant manufactures in excess of 2 billion pounds of chemical products annually including methyl methacrylate and various acrylates. 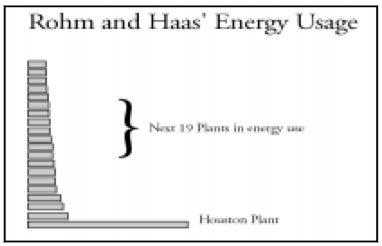 Accordingly, this plant, alone, accounts for approximately 35 percent of all Rohm & Haas' corporate energy consumption. These chemical monomers form the building blocks for other Rohm & Haas products, so the energy efficiency at the Deer Park plant translates across the entire supply chain, from chemical feedstock to consumer end products. The plant consists of eleven different production areas that operate as individual production facilities or "Plants Within A Plant" (PWP). Many of these processes are highly exothermic, and thus, much of Deer Park's steam production results from "waste" heat sources. There are five steam use levels at the Deer Park Plant - 600, 150, 75, 35, & 15 psi. Out of approximately 1,000,000 lbs/hr of the 600 psi steam load, the boiler house only produces on average approximately 200,000 lbs/ hr. All of the 150 psi and lower pressure steam is produced by waste heat boilers, backpressure turbines, and let down stations. Much of the energy efficiency gains since 1997 have been achieved by capitalizing on the optimization of cross process and overall plant utility integration – an over-all plant systems approach between PWPs. Efficiency gains here also resulted from taking advantage of the plant's large amount of by-product energy production. The PWPs are each independent with respect to production demands, and yet, have a high degree of utility interdependence. Thus, a major challenge was to better integrate this highly complex facility to a new level of energy optimization. In the first fifty years of its operation, the plant saw a varying and inconsistent degree of emphasis on energy efficiency. Most previous energy efficiency efforts were individual specialists focusing on specific issues. The current program really began in 1997, with the formation of a plant-wide energy team. This energy team sponsored an independent plant-wide energy survey and pinch analysis. They then created a disciplined database of energy efficiency improvement opportunities. They subsequently implemented a plant-wide energy monitoring and optimization system based on the software package "Visual Mesa." Key to the Deer Park plant's success in energy efficiency was the plant's willingness to work as a team within the many business units in the plant. A well-defined mission and energy management strategy that aimed to deliver the lowest total long-term production cost. Establishment of energy program critical success factors. A willingness to reach out beyond the plant's borders to understand the best practices in energy efficiency by attending energy seminars, conferences, networking with companies, energy agencies, etc. The outside knowledge acquired was married with decades of "lessons learned" at the Deer Park facility to develop a comprehensive inventory of potential resources and opportunities. A dual timeline approach to select potential projects for implementation. A short-term tactical plan was used to identify and implement stand-alone projects to quickly deliver on reduced energy and utility costs. A mix of longer term, strategic projects were implemented to ensure the development of systems and infrastructure to deliver sustainable energy savings in the future. Opportunities identified were at both the utility and process area level. Communicating metrics to track progress towards goals to management/operational staff. Reporting progress to energy stakeholders to assure program deliverables are aligned with business requirements and program gaps (funding, resources, etc.) are resolved. Staying on track-decreasing budgeted energy usages to reflect forecasted commitments. Developing a sufficient knowledge of plant utility systems to enable proper technical and financial analysis of energy opportunities. Recommending a plant-wide energy management system that provides real time energy cost information and optimization recommendations (i.e., operations staff will be more aware of the energy cost implications when making process operation changes). Shift plant utility cost system so that each business unit pays for actual usage. To date the team has identified over 125 projects and more than 40 percent have been implemented over the last 3 years. Roughly 20 percent are still under evaluation, with the remaining percentage not currently justifiable. Examples of the actions taken to achieve energy savings, include: internal energy audit (1995), compressed air leak audit (1998, Petro Chem), fired heater audit (1998, Zink), motor systems assessment (1998, Planergy), plant site energy assessment (1998, Reliant Energy Services), instrument air compressor and dryer audit (1998), building lighting survey (1998, Wholesale Electric), steam system leak and trap assessment (1999, Petro Chem), DOEOIT "Pumping Systems Assessment Tool" assessment (1999, Oak Ridge National Lab), Pinch Technology assessment (1999, internal staff), infrared thermography audit (1999), real time energy optimizer analyses (2000), second steam system assessment (2000, Armstrong Services), and site assessment (2000, Energy Service Co.). Understood and actually managed as part of the business. Addressed aggressively at the design level. Enabled adequately with instrumentation and a management system. Instrumented and optimized on a continuous basis by operations. A key plank of the Monomers Business Mission. Optimized for the whole site. The real time presentation of strategic energy information including data acquisition, presentation, and metrics. A strategic energy-based decision-making tool with a Monte Carlo-(statistical probability) type front end. A system for site-wide continuous operational energy optimization. A system or tools for local continuous opera-tional optimization. After considerable investigation, the team concluded that no single tool could provide all four deliverables completely. 1. The real-time presentation of strategic energy information including data acquisition, presentation, and metrics. This deliverable includes the field instrumentation, IT infrastructure, and software for data acquisition, data analysis, and data presentation. The data presentation includes displays for operators, unit managers and engineers, plant managers and engineers, as well as metric calculation and tracking. This system was already partially in place. It was theoretically possible to completely accomplish this deliverable with in-house designed IT infrastructure and software in addition to appropriate field instrumentation. For example, projects to automate the control of the 150 psig and 75 psig steam headers and to provide a tool for steam vent and let down tracking were already underway. There were also plans to provide a means for performance monitoring and performance prediction of key energy equipment. However, it was the opinion of the team that the benefit of performance monitoring, performance prediction of key energy equipment, and identifying all possible metrics would only be realized with a plant-wide system. A plant-wide system could probably be developed in-house, but the team felt that this would not be cost effective. The team also felt that the true benefits of performance monitoring and metrics would only be realized if the system was owned by one person who had the commitment of the area managers to implement the recommendations. Whenever the term performance monitoring is used, it is intended to include performance monitoring and instrumentation monitoring. 2. A strategic energy based decision-making tool with a Monte Carlo type front end. This deliverable would provide a tool that would allow good business decisions to be made based on current and projected energy usages in the plant. The Deer Park plant is made up of semi-independent production units that share utilities but whose energy and utility usages are strong functions of their own individual business conditions. A plant energy model that accurately shows the current conditions can be used to predict the future minimum usages, the future average usages, and the future maximum usages. Business decisions (for example, the choice between a steam turbine and an electric motor as a driver) based on each of the minimum, average, and maximum cases, may be different for each case. The actual usages in future years would probably be different than any of the aforementioned cases. Thus, in order to make the decision most likely to be the best decision, a Monte Carlo-type analysis allowing for the input of ranges of future energy uses and their probability distributions needs to be performed providing statistical predictions of likely plant energy usages. The resident utility process expert had developed an excellent spreadsheet model of the plant steam system that was very nearly complete. One solution would be to continue work to finish this model and to incorporate a Monte Carlo-type front end such as "@Risk" or "Crystal Ball". However, this would require a significant amount of time and would delay the development of other energy-saving projects. Another option would be to ask the supplier of the plant-wide energy management system (for example, Visual Mesa) to incorporate an Excel-based input tool that could then use "Crystal Ball" or "@Risk" to drive the Monte Carlo analysis. Because "VisualMesa" was ultimately chosen as the means to provide the other deliverables, the latter option was chosen to provide this deliverable. 3. A system for site-wide continuous operational energy optimization. This system includes taking the data from the first deliverable (real-time presentation of strategic in formation) and incorporating it into a plant-wide optimizer program. The ultimate goal would be to make as much of this optimization as possible closed-loop, but the initial phase would probably be advisory only. If an optimization program was selected, it would also facilitate the first two deliverables. After looking at many different software platforms and programs, the team chose the VisualMesa program offered by Nelson and Roseme. The sitewide system includes all steam, all fuels including waste fuels, and condensate. It provides real-time optimization, providing new energy-saving opportunities. The team is currently building a Monte-Carlo-type front-end to facilitate "what- if" studies. 4. A system or tools for local continuous operational optimization. The VisualMesa based optimization program allows for some local continuous operational optimization. There was also an alliance announced separately to use AspenTech's suite of process optimization tools at this site. The team decided to handle local optimization on a case-by-case basis. The team still strongly believes that there is much benefit to be had from local continuous operational optimization, especially if that optimization can be made to be closed loop. An owner/champion must be designated immediately. This person should be responsible for ensuring that the instrumentation, IT infrastructure, and model are kept up to date and are reliably maintained. This person should also be responsible for, and have the authority to, ensure that the units are held accountable for their energy use. Businesses must be held accountable for energy used per pound of product and other energy metrics. A cultural change is needed that will allow the implementation of energy optimization. For example, a true paradigm shift on operating philosophy for controlling 150#/75# let downs and vents. The Energy Management System must be used in order to obtain benefits. The instrumentation must be reliably maintained. The readings must be believable. Resources must be made available to implement identified operational improvements. Performance must be monitored and indicated deviations from target acted upon in a timely manner. Adequate training must be provided. The Energy Management System must show where operational improvements can be made relatively quickly. 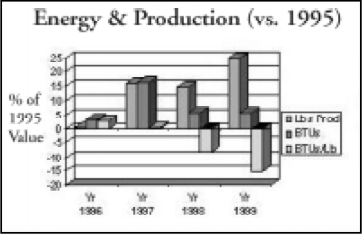 A 17 percent energy reduction on a per pound of chemical production basis-see graph above. Since 1997, absolute energy consumption has decreased 10 percent even though production went up by 7.7 percent. The Deer Park plant's energy savings achievements have already exceeded a 2005 Rohm and Haas corporate goal to reduce energy consumption by 15 percent (per pound basis) from 1995 levels. NOx = 800 tons per year. Increased use of energy usage and cost performance metrics for day-to-day operations. Increased day-to-day use of the real time plant-wide energy management system. Continued facilitation of a plant culture where energy awareness is well understood and practiced at both plant operating and engineering design levels. Increased use of advanced process control. Increased use of metrics and accountability. Extension to water and other sustainability resources. Extension to other plants/replication across corporation. The author would like to acknowledge the invaluable help of Mr. Jeff Hackworth, Energy Manager for the Deer Park Facility, and Mr. Paul Scheihing, of the U.S. Dept. of Energy in providing much of the information for this article and, in fact, writing much of the text. He would also like to acknowledge the dedication and commitment of the members of the energy team, without whose efforts, these successes would never have happened.